Sonic's new Wii U adventure delivers on both the speed and exploration fronts. Scroll down to the bottom for a video review. Sonic’s been on a roll as of late. 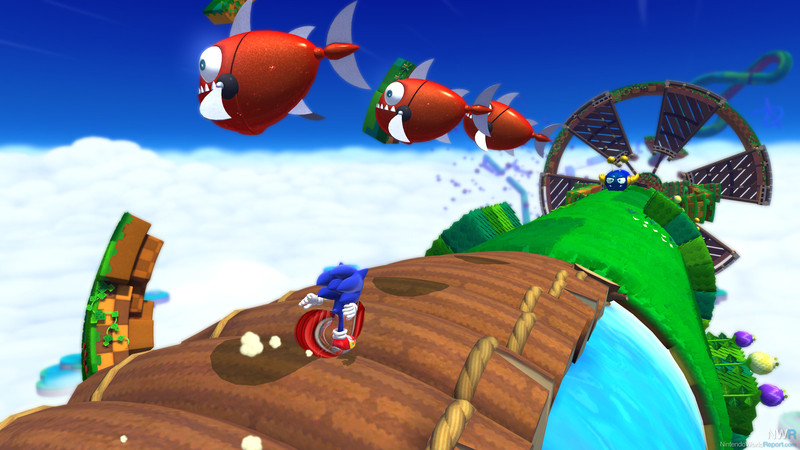 Both Sonic Colors and Sonic Generations succeeded where past 3D efforts failed by returning the focus to platforming. Thankfully, Sonic Lost World, Sonic’s latest adventure on the Wii U, is not only built from the same mold, but its best moments feel like the first accurate representation of classic 2D Sonic gameplay in three dimensions. One of the great things about the Genesis Sonic games were the branching pathways through the levels. While recent 3D Sonic titles have offered different routes, Sonic Lost World has taken things to next level with its spherical land masses. Reminiscent of Super Mario Galaxy, Sonic can run 360 degrees around the game’s floating islands and the developers take full advantage by filling every nook and cranny with obstacles and shortcuts. To make Sonic’s journey through the sometimes-devious stage layouts a bit easier, Sonic Team has endowed the hedgehog with some new moves. The new parkour system lets Sonic automatically hop over small obstacles and allows him to run up and along walls. A new kick move lets Sonic disable the armor of certain enemies and can also let him send other Badniks flying into the air. The Spin Dash and Homing Attack make a return, and now Sonic has a dedicated run button to give the player precise control of his speed. Another important part of Sonic’s arsenal is the return of Color Powers. Favorites from Sonic Colors like the Yellow Wisp Drill are back and are still a lot of fun to use. However, a number of the new Wisps utilize the Wii U GamePad in sometimes unexciting fashion. For example, the brand new Magenta Rhythm Color Power lets you to tap on musical notes on the touch screen to bounce around the stage. Instead of being enjoyable and intuitive, it feels like more of an annoyance that slows down the action. Along with the wonderfully inventive spherical-filled zones, Sonic Lost World also features a number of 2D areas that play quite similarly to those found in Sonic Colors. Sonic’s new parkour system can be used in the 2D areas as well, but you will mostly need to use your standard jumping skills to traverse these areas. The jumping controls can be a bit floaty and will sometimes result in an unintended plunge to Sonic’s doom. Along with Dr. Robotnik (I will never call him Eggman), Sonic must faceoff with six menacing creatures known as the Deady Six. The boss battles against the Deadly Six are quite varied and range from throwbacks to Genesis boss fights to one in particular that feels like it could have come straight out of Super Mario Galaxy. Sonic Lost World does a good job of playing on the nostalgia of old Sonic fans. There are returning Badniks in every zone of the game, and there are number of other nods to the past such as the return of casino pinball. Another area of the game that appears to take some inspiration from the Mario series is the inclusion of a Super Guide-like help system. If you die numerous times in a section of a level, you will be given the option of skipping to the next checkpoint. There are a few 2D sections that are quite aggravating near the end of the game, making the skipping ability quite welcome. Sonic Lost World has a very simple and clean graphical style so that the game can run at a smooth 60 frames-per-second. While the game does feature occasional bouts of slowdown, Sonic races through the levels at a silky smooth clip for the majority of the time. However, you will notice a bit of scenery pop-up when running through the levels. While the game’s soundtrack is quite pleasant and fits with the scenery, the absence of music by Kenichi Tokoi, who composed many of the great tunes for Sonic Colors, is certainly noticeable. When Nintendo first brought Mario into 3D in Super Mario 64, it was clear that, while the gameplay had evolved, the basic essence of Mario had remained true. One could argue that it has taken Sega 17 years to finally allow Sonic to make that leap. It’s exhilarating to race across cylinders and use Sonic’s new moves to wall jump through a spike-filled area, although not every stage of Sonic Lost World is a true playground for Sonic’s new abilities. Despite the uneven level of polish on the stages, Sonic Lost World is a great platformer that shouldn’t be missed. A nicely-written review; thank you. Any impressions of the Nights into Dreams content? That's what has me most interested in the game, and I haven't read mention of it in any site's reviews. Was it made available to you? You seem to enjoy this game a little bit more than most of the reviews I've read this morning. I hope my opinion on this game matches yours. I'm just so excited for it! I tried downloading the Nights DLC a few days ago, but it wasn't available yet. Will make a video when I have it. I got this today and have played until the first level of the second world. It is good, I like how Sonic controls and he no longer feels too slippery. The levels seem like they will be fun to master, or at least become more competent in. On a scale from one to ten how would you rate your experience so far? Excited to play this. Will have to wait a couple of weeks for the North American release date, but I still have to go through Wind Waker HD. I can deal, then! So far I'd say my enjoyment would be around an 8. Thats a very rough guide though as I have not played too far into it yet, although I am a little further now than I was. Added a video review to the article. Great video review. Thanks. Looking forward to picking up this game, probably soon. Is it on the e-shop, anyone know?